Personify the beautiful appeal of nature with the Woodland Bolero Jacket with Hood, featuring a bolero style leather vest with a gorgeous full green hood attached which is made from supple forest green garment leather. Brown leather trim is featured around the opening of the hood and is cut and engraved in in a way to appear as a branch. Accenting this trim are dark green leather leaves which create an overall natural woodland appeal. The full hood design allows for a mysterious and partially concealed look. The back of this bolero jacket is engraved with an exquisite wood grain design, adding to the woodland theme. The bolero jacket has an adjustable leather strap which buckles across the chest. This jacket is crafted from 8/9 ounce leather and detailed with antique brass hardware. 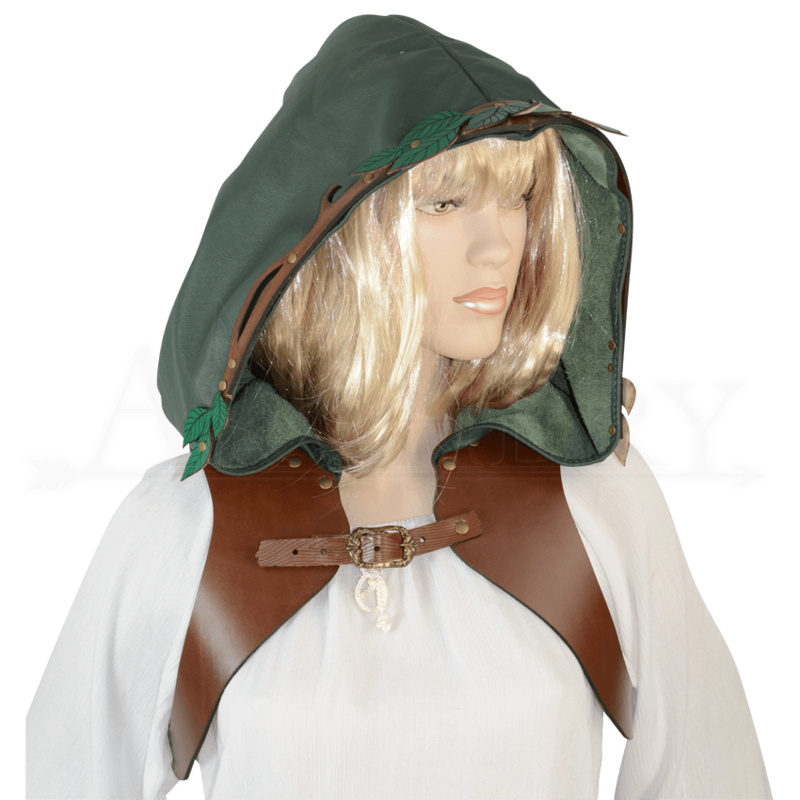 This wonderful hooded jacket is compatible with our Woodland Tree Antique Bark Pauldrons (DK5109) and supremely enhanced when paired with other woodland themed armour. Antique brass eyelets are featured on each shoulder, allowing for any pauldrons to be securely attached with lace. Embrace the majestic look of the woods in your next battle with the Woodland Bolero Jacket with Hood.